APEGG Ltd has just completed a further level one, glass production training programme to a valued customer in the Middle East. The training was provided in Dubai, UAE, to the appointed Coca-Cola bottlers in the region, on behalf of APEGG clients Coca-Cola Middle East. Following a previous professionally delivered training in Pakistan by APEGG, Coca-Cola Middle East recommended similar training to other bottlers. The training programme covering glass manufacture, the processes involved and the outlining of glass defects, is very beneficial for their bottlers and provides them with an insight into the container manufacturing process. “It is important for us at Coca-Cola to ensure that our fillers’ staff are trained to the highest possible level. We see APEGG as a suitable partner for Coca-Cola Middle East to provide educational programmes relating to glass manufacture to our staff and fillers”. Glass fracture analysis and its consequences. 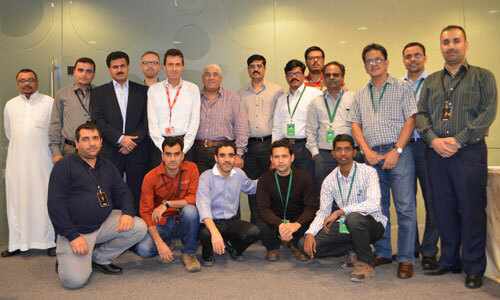 Following the 2 day training course which took place at the Coca-Cola Middle East headquarters, the management from Coca-Cola and the bottler confirmed the worthiness of the training provided and also confirmed that additional training programmes will be scheduled. Mr. Nicola Ayyash – Packaging Manager Coca-Cola Middle East said afterwards “Coca-Cola Middle East recommends APEGG as an education provider. The information was delivered in a professional manner and we are thankful for the informative training given in the specialist areas relating to glass container manufacture”.